Tonight is Purim and it's a holiday of joy and celebration. - Buddhism: If sh*t happens, it really isn't sh*t.
- Hinduism: This sh*t has happened before. - Islam: If sh*t happens, it is the will of Allah. - Catholicism: Sh*t happens because you deserve it. - Protestantism: Work harder or sh*t will happen. - Judaism: Why does this sh*t always happen to us? 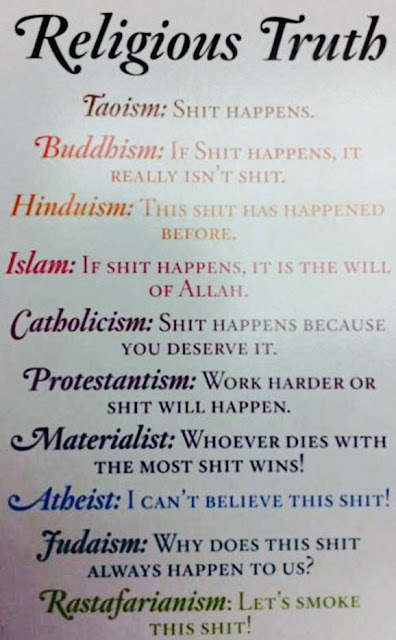 It's funny how each religion of the world has a perspective on life.